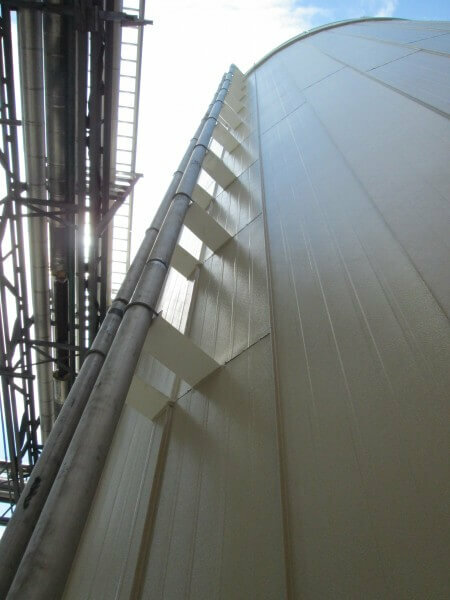 MC&I designed, manufactured and installed the RIDGLOK® Vertical Standing Seam Panel Insulation System on a Flat Bolted Tank, located in Chicago, Il. The agricultural tank was utilized to hold Fats, Grease and Oils for an oil recycling facility. The large tank was a 30.77′ diameter x 50.65′ high flat bolted tank. The RIDGLOK® Panel Insulation project was completed August 13, 2013. RIDGLOK® Vertical Standing Seam Insulated Panel System consisted of 0.024 stucco-embossed aluminum metal jacketing, in Fawn, laminated to 2.0″ thickness of polyisocyanurate insulation board. R-value of 13.1, using a standard roof system. RIDGLOK® Standing Seam Panel Insulation Systems REDUCE temperature difference to help CONTROL condensation for IMPROVED process control. Insulation of storage tanks REDUCES routine maintenance and PREVENTS energy waste and LOWERS fuel costs. 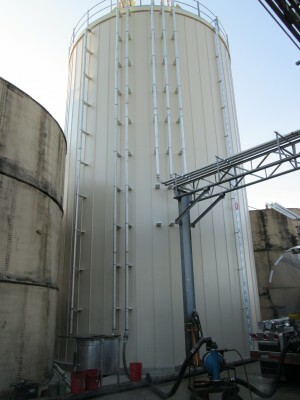 There are multiple benefits to insulating agricultural storage silos, such as the tanks above. Tank insulation helps control condensation, which helps minimize mold & mildew. It also minimizes freezing of the stored products in the silo, allowing for more even distribution of the product with the silo unloader. Insulation saves on monthly energy costs by conserving heating or cooling, if the product requires it. 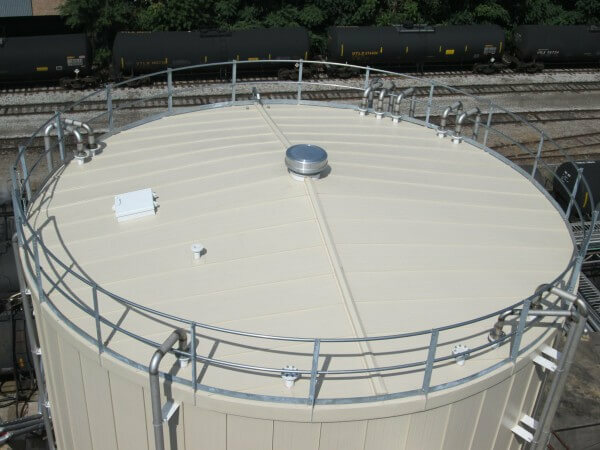 For Process control, tank insulation will protect the product from freezing or being heated by solar radiation. It will also reduce the cooling of the stored substance, which may prevent it from setting and remaining in a solid form. In both cases, additional heating or cooling may be required.